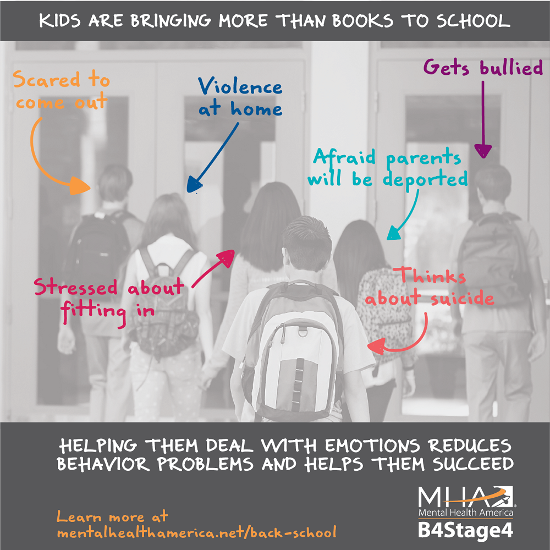 It's time to go back to school and, for many children, that means far more stress than just grades or what to wear (as if those were not stressful enough). Be aware. Be considerate. Everyone you meet is going through something. In the case of children, they are usually going through it with no experience, no knowledge, and no training. You can help. If you or someone you know is in crisis, please call the National Suicide Prevention Lifeline at 1-800-273-TALK(8255) any time day or night. If you are in the USA, you can also text HOME to 741741. Someone is always there. You are not alone.